Autonomous cars rely heavily on wireless communication techniques, such as vehicles to vehicles, navigation route information, GPS, and other driver data. Autonomous cars continue to communicate with various sites to remotely monitor the inner and outer states. These access networks increase the risk of malicious attacks on autonomous vehicles. Cube solves this autonomous vehicle security problem by using blockchain technology, in-depth AI-based learning and quantum hash cryptography. Going forward, the $ 770 billion automotive automotive market will see Cube as the first user of blockchain-based security. We will provide autonomous vehicle security platforms for companies such as automotive manufacturers, and related companies, such as Google and Uber. Block Layers: The key to Blockchain is ensuring technology trust. 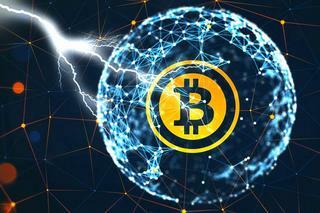 CUBE uses block-chain technology to ensure the safety of autonomous mobile networks. In the operation of autonomous vehicles, many IOTs provide information to autonomous vehicles. Attackers are trying to gain access to the network between an autonomous car and IoT or traffic center. In such cases, the hash of the infected binary is different from the hash included in the multisig transaction signed by the SW and OEM providers. Thus, the vehicle can easily detect such attacks before installing infected SW updates. An incorrect update sharing by claiming to be an OEM or SW update provider may be terminated because the overlay nodal knows the OEM Public Key and SW update provider. AI Deep - Learning Layer: The second layer is the AI ​​layer. This layer will be applied in part from 2019, and will be commercialized from 2020. Currently, network security is a passive system that collects patches to prevent reuse of methods used in past hacking cases. Cube will train, in supervisor mode, use the past as the main case for building a defense system against future attacks by creating a dangerous attack scenario that is likely to be done hundreds of millions of times. Cube intrusion detection systems, using inner neural networks for vehicle network security, have two parts, a discriminatory internal architecture and a generative inside architecture, depending on how the architecture is exploited. After the pre-training phase is complete, fine-tuning will be done using the gradient descent method with supervised learning. While blockchain is used as the first and primary security method, AI-based security in learning will ensure multiple defense systems. Blockchain has improved security by using hashes appropriately. However, there are concerns that as computer performance grows rapidly, hash cryptography can be a limitation. Cube develops quantum cryptography to prevent malicious attacks against autonomous vehicles. This quantum cryptography will contribute not only to the autonomous drive, but also to the overall improvement of Blockchain's overall technology. Cryptography Layer Desire This passion will be applied from the year 2022. The Cube's quantum hash technology will provide an important opportunity to ensure high levels of security throughout the blockchain field using simple hash technology. Cube improves the level of security by using the changing quantum characteristics, The characteristics that the data receive depend on the angle of polarization; Furthermore, data characteristics are destroyed in the event of malicious attacks. OTA technology is a technology that can remotely upgrade remote automotive software. Automotive software can improve patch performance and bugs through upgrades. CUBE will provide remote diagnostic and installation software and patches of bugs from existing automotive software from remote with OTA technology based on blockchains. There are plans to sell automotive vehicle security platform technology based on blockchain by 2019. The two main sales models will include the sale of CUBE technology licenses and the sale of application technology. In the traditional automotive market, CUBE connects OBDs with Bluetooth devices to support the installation of personal diagnostics and remote software for cars. Global premiums for long distance car updates generate revenue for CUBE. In the autonomous car market, CUBE generates revenue by providing network security platforms from automotive car companies such as Tesla, Google, and Uber. CUBE will distribute revenue to CUBE Token Owners. 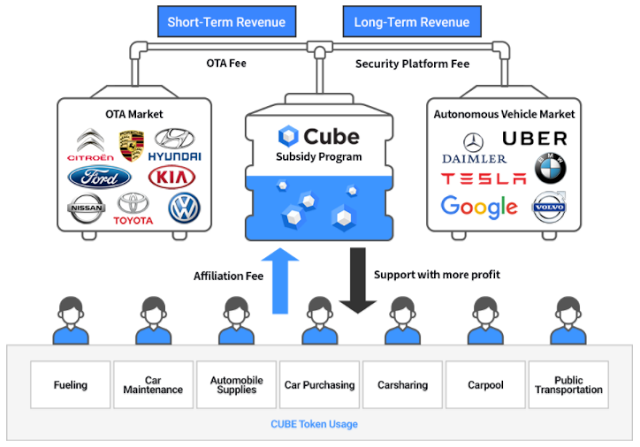 Cube tokens are available at CUBE stores such as gasoline, car maintenance, and new car purchases. As CUBE merchants pay CUBE for their merchant fees, CUBE revenues will increase further. The cube should be audited annually by a reputable accounting firm worldwide. Cube will publish its monthly operational and financial reports to share the operational status of the company with its contributors. Cube will share monthly reports to share important company updates. Cube executive managers are bound by a lock-up system, which means they have no right to make a token sale for a year. The lock-up policy is intended to ensure the executive manager receives the appropriate remuneration only after the company grows sufficiently. Cube must strictly control its budget usage to significantly increase the value of the Cube token. The Cube business model should always be built to create a high actual income. Profit models involve short-term and mixed models so as to maintain high valuations.